From Chevy Impalas and Ford Models Ts to Stanley Steamers and Hot Rods, Linvilla’s covered many acres with pristine automobiles that are guaranteed to make your heart race. Get there early to peruse the flea market filled with a variety of hubcaps, wheel covers, carburetors, crafts, and jewelry, then refuel at the Farm Market or Linvilla Grill. Kids can get in on the act too; NASCAR bound babes will love the miniature remote controlled cars, while more laid back types may want to hop on a hayride. Stop by Linvilla’s character car wash while you are there, anytime from 10 am to 2 pm, all proceeds benefit the American Red Cross Chester-Wallingford Chapter. Whatever you choose to do, everyone’s bound to find something that’s just their speed. This day is sure to be fun for the whole family. 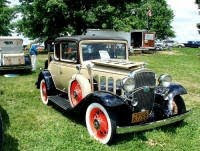 To exhibit an antique car or register for the flea market, log onto www.historicalcarclub.org and download a flier.